Fishing takes many guises in the lagoon. Crude spear guns, a single line from a wooden canoe, violent splashing into a fish trap, a hand woven net, or a bit of shade cloth tied to two sticks. Most fisherman have some or all of the above techniques in their artillery. But first one must have bait, and it is not a matter of stopping by the tackle shop to buy a block of frozen mulies or prawns. This fine demonstration shows the scoop-and-hope technique. 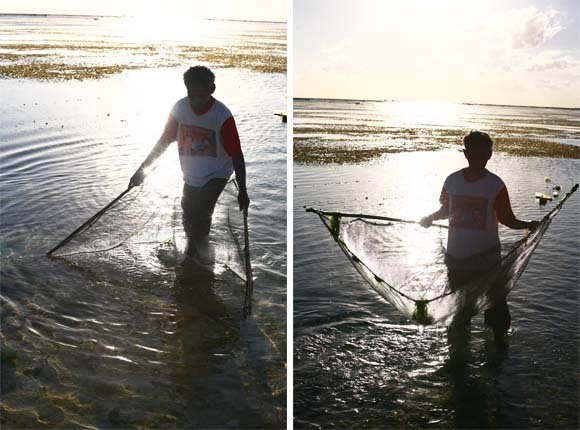 Grandad walks in the shallows, searching for tiddlers, and when he spots one his granddaughter scares them toward the net. One quick scoop and hopefully a capture. The unsuspecting fish is put into a plastic bottle and the process repeated. What doesn't get used for bait will be eaten for dinner with some rice and chilli. The most simple technique, requiring no tools, is to dig a hole in the lagoon sand and sift for sand critters.